Wheel loaders are mainstays of construction, agriculture and other heavy equipment fleets. Operators count on them for superior digging, lifting and backfilling power. Generally considered to be more economical to run than track loaders, wheel loaders are an excellent addition whether your work involves mining, waste management, material handling or other demanding tasks. To get the most out of your fleet, consider upgrading to a set of solid rubber wheel loader tires by McLaren Industries. Our products offer improved performance compared to most stock tires, and they are suitable for use on machines by all manufacturers. McLaren Industries' solid wheel loader tires deliver better traction without compromising ride quality. Upgrading your tires to one of our Nu-Air® products will make your wheel loader more versatile — expanding its potential uses and allowing you to do more with fewer pieces of equipment. Compared to pneumatic tires, our products offer better puncture resistance, which translates to less downtime and improved productivity. As well, our puncture-proof solid cushion wheel loader tires lower your machine's center of gravity for added stability. - Nu-Air Dirt Terrain (DT): The DT is our most versatile tire, ideal for a variety of on- and off-road applications and working conditions. Like all Nu-Air tires, it features our exclusive Semi-Pneumatic Technology™, a three-layer design that balances comfort with puncture-resistant strength. 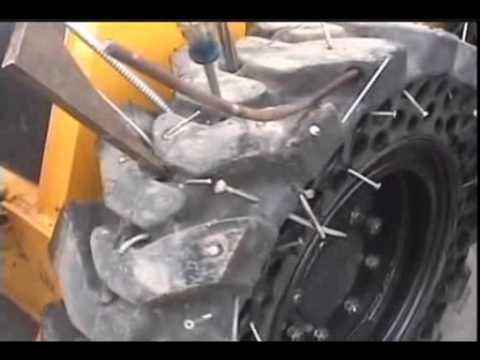 Use the DT tire in general construction, mining, scrap yards and other job sites. Sizes include 17.5x25 (53X17.5-25), 23.5x25 (63X23.5-25), 26.5x25 (68X26.5-25) and 18.00-20 (48X18-20). - Nu-Air All Terrain (AT): The AT model takes the core features of the DT and adds a wider footprint for increased contact with the ground, as well as a self-cleaning tread pattern that performs better in wet and rainy conditions. We offer the AT in multiple sizes for all types of wheel loader: 17.5x25 (53X17.5-25), 20.5x25 (58X20.5-25), 23.5x25 (63X23.5-25), 26.5x25 (68X26.5-25), 29.5x25 (74X29.5-25), 35/65-33 (80X33.5-33). - Nu-Air Rocky Terrain (RT): The RT is our best solid wheel loader tire for rough and rocky terrain. We've engineered it for maximum traction when working on rocks, debris and scrap, or in any other harsh environment. The RT comes in 18.00-25 (64X18-25) sizing only. -Nu-Air Super Slick (SS): The SS is a practical, economical choice for use exclusively on flat surfaces. Because it has no tread, it will wear out slower, which means more time between replacements and more value for your money. Available in 17.5x25 (53X17.5-25), 18.00-25 (64X18-25), 20.5x25 (58X20.5-25), 23.5x25 (63X23.5-25) and 26.5x25 (68X26.5-25) sizes. For help choosing the best replacement wheel loader tires for your fleet, give us a call at (800) 836-0040. You can also request a quote for your loader replacement tires. McLaren's Nu-Air tires can handle extreme loads for a variety of wheel loader models and various working conditions. McLaren DT pattern is ideal for heavy duty work in environments with high risk of punctures, damage and impact, such as scrap yards, loading and surface mining fields. 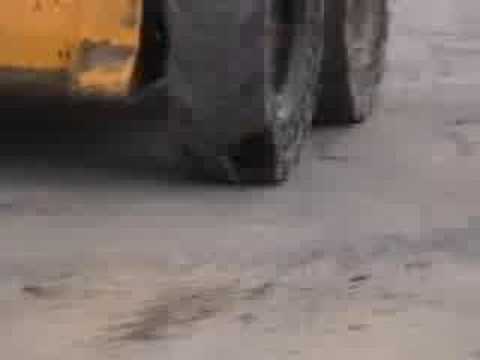 AT pattern is the most practical choice for heavy load applications on abrasive surfaces such as asphalt and concrete. These wheel loader tires ensure optimal performance on muddy and wet conditions due to the self-cleaning properties of the AT pattern. The Nu-Air® Rocky Terrain (RT) OTR tires are constructed to stand up to and perform well in the toughest environments. The RT tread pattern provides maximum traction on harsh, rocky terrain as well as in scrap yard and demolition applications. The Nu-Air® Super Slick (SS) OTR Tires have no tread pattern are the most practical choice if the machine is only being run on asphalt or concrete. These will provide a smoother ride and will outlast our tires that have tread patterns.